All the arguments and noise on who is going to be the next Nigerian President is coming to an end and its time for action, the time Nigerians need to decide who they really want as a President. We don't even have days before the 2019 general election but a matter of a few hours from now but the question is, are you ready to vote and exercise your franchise? I have not actually published any post about the upcoming general election until now because I was busy monitoring the situation and peoples mindset towards the 2019 general election. Specifically, I am not here to predict who is going to win the election but I was motivated to write about this post after perceiving some negative beliefs and mindsets of the people. Don't mind me anyway, you are entitled to your own belief and thoughts, you have every right to decide what you do and how you do them but I have got something important to tell you. No doubt, what I call negative might be positive to you and there is nothing wrong with that but I will surely try to prove my point why I tagged certain thinking and beliefs negative. How do you see the upcoming election? Why are you not willing to vote? My observations after asking these questions, I noticed that many don't wish to be part of the election and not willing to come out and cast their vote especially the Igbos with the reason that things might turn violent and the only way to protect their life is to stay at home. 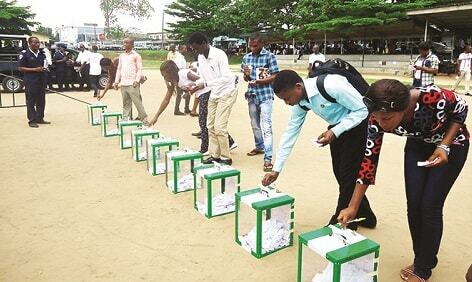 Many also think that their vote will not count and don't see any reason to stress themselves while some believe they don't belong to Nigeria and shouldn't be involved. Well, you are right in your own way but let me tell you something, abstaining yourself will not favor you in any way and if you are still following the initial boycott election order issued by Nnamdi Kanu then you are making a mistake because you can't achieve freedom by abstaining yourself from the election and even Nnamdi Kanu later retracted his steps and recently called off the election boycott order understanding the negative impact it will incur to Igbos. Use what happened in Anambra state as a lesson, after you were instructed to boycott election does it prevent them from having a Governor or prevent Obiano from emerging as a winner in one way or the other. Anambra state Governorship election was boycotted by many as instructed by IPOB but now does that give you the freedom you desire or help in any way, yet you follow and obey all the rules and regulations made by the Governor that you don't want to vote in or out. Believing that your vote will not count is equally not wise thinking because two wrongs don't make right, you need to do your own part and hope for the best. We all pray for a peaceful election and don't wish to see any violence in any part of Nigeria and by his grace you will be safe while casting your vote, in that way you are doing the right thing and helping the entire country. Finally, be a good Nigerian and help decide the next Nigerian President because when you don't vote you are cheating yourself.